The Neighborhood Alliance building with a Matt Beard seascape over the door. Talking about art is hazardous. We might be imprecise or get bogged down in biographical minutia or jargon. Talking about surfing is worse. Every surf article published since the 1960s suggests something like Fight Club: you don't talk about where you surf, lest you betray other initiates. And anyway, surfing's a transcendent experience, the stoke of which can only be hinted at through the coarse medium of language. Dude. So, the genre of surf art is doubly fraught with peril. 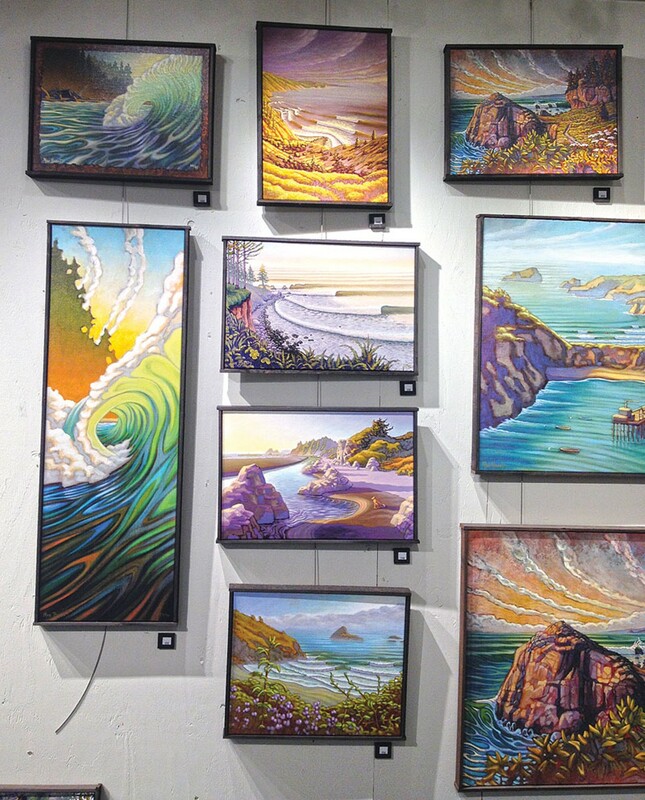 Painter Matt Beard, who's been making art since he was 16 and surfing since he was 12, opened up a micro-gallery in the Neighborhood Alliance building in Arcata last year. The Neighborhood Alliance is housed in a Quonset hut with a vividly colored, almost abstract Beard waterscape over the threshold. 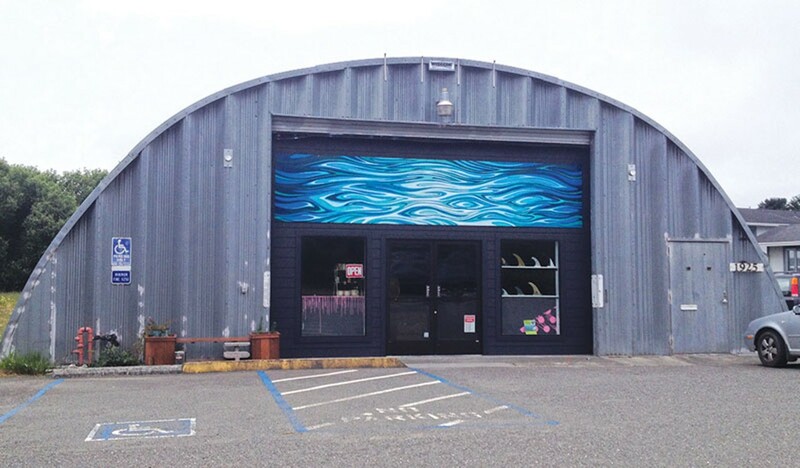 The tin roof shelters a cluster of synergistically connected businesses — among them surfboard shaping and repair by Greg Cicero, Marnie Nave's Seapod hand-printed hoodies and textiles, succulent garden design by Fancy Plantsy and BeardArt's paintings. Artist-owned spaces like the Alliance have been popping up with increasing frequency. The artists associated with these spaces are opting out of traditionally structured art sales with the gallery as middleman and gatekeeper. In an online chat, Beard talked about the new venture and answered questions about surfing, art and the space between. How did you learn your craft as a painter? MB: Still working on it. Lots of trial and error. Mostly error. I did go to [Humboldt State University], where I tuned out and completely ignored a lot of great advice from some really great professors, like Theresa Stanley and Leslie Price. I see their art around town and still get nervous that they'll catch me slacking. How are surfing and painting connected for you? MB: Surfing is just one part of my life. But when I make art about walking around the block when I'm stressed out, folks don't respond to it nearly as well. A "surf artist" works with limited subjects: surfers, waves, beaches. Do these restrictions enhance creativity, like poetry in a strict form? MB: What is implied is often more powerful than what is stated plainly. So I have series where waves are the subject of every painting, but not a single actual wave is painted. My insinuation pieces focus on the water in front of a breaking wave and the shadow the wave casts, while my sine series explores waves from a more cerebral, mathematical perspective. I like your almost-abstract paintings of water in motion. I understand you painted one of these live at Arcata Theatre Lounge's Ocean Night last year. MB: The live art pieces are a different animal altogether from the studio art or outdoor plein air work that I enjoy. The live art pieces require a willingness to launch an embarrassing dud in a room full of expectant eyes. I sort of insist on coming to a live piece with no plan whatsoever. Things go sideways all the time, so you may as well just stay flexible and flow with it. It's a pressure cooker of adrenaline that can't be matched in the studio, giving it a much more heightened "in the moment" feeling. Kinda like surfing, but sheesh, I wish there was a better way to say that. Surfing is one of those things that almost shouldn't really be talked about ever. Since the 1960s a genre of surf art has emerged with its own exhibition spaces, collectors and markets. Are you inspired by the traditional heroes of surf art, like John Severson? Contemporary artists like William Mackinnon? MB: Two main vectors of inspiration in my work come from Rick Griffin's iconic rock concert graphic work from the '60s and '70s and William Wendt's California impressionism from the early 20th century. But my hero is Rick Griffin. A lot of artists in our little world would say the same, but shoot, it was his work that turned me on to the reality that art could be anything at all. He died in a motorcycle accident in 1991 and all the surf magazines ran tributes to his life and work and that's where I found the spark to get this art fire going. Contemporary artists like Erik Abel in Ventura and Spencer Reynolds up in Brookings are pretty far out. And good people, too. The Neighborhood Alliance has been around since October. How did you get connected with this project? Because it's shared space with independent artists' micro-galleries, the Alliance represents a change in the way artists traditionally connect with the public. How did you and your partners decide to establish this kind of business? MB: ... Nobody was approaching this with any intent to change the way things work, it was more of a natural convergence of folks already moving in the same direction. I'd had a space of my own in Eureka's Henderson Center for a few years ... I took a big risk leaving behind my old shop, but since when did making art not involve risk? My little micro gallery arose out of just wanting a space to do my thing independently while still being part of a group effort where we all benefit from one another's energy, passion, ideas and presence.